Our Annual Tour de Paris Bicycle Rally gets bigger and better every year. We have 18 Rest Stops fully loaded to assist our riders along the 20, 35, 57, 68, or 80 mile ride around Historic Downtown Paris, and through scenic rural areas, or riders can enjoy the 14 mile ride on our bike trail. Goodie Bags, shirts, and a hamburger dinner are some of the cool perks you can expect from our wonderful and friendly volunteers. Friday, July 19, 2019, 5—8 pm, is an all-you can-eat $5 Spaghetti Dinner and late registration/packet pick-up at Love Civic Center—2025 S Collegiate. Event day Registration and an all-you can-eat $5 Pancake Breakfast 6 am—7:45 am. Rides start at 8 am for the 20, 35, 57, 68, or 80 mile ride around Historic Downtown Paris, and through scenic rural areas, or enjoy the 14 mile ride on our bike trail. Free hamburger and fruit smoothie after your ride. Early packet pick-up at Richardson Bike Mart on Saturday, July 13, 2019 10am—6pm. 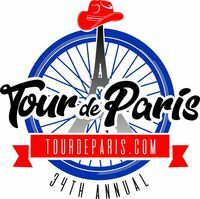 Go to www.tourdeparis.com for more information.